This Euler’s Spinning Disk is more of an adult toy than a child’s distraction. It is a high-quality gadget that explores the scientific phenomenon of spinning. Ha! Bet you were not thinking of the science of spinning disks when you eyeballed this! Anyway, our old friend Euler studied the movement of a heavy-ish disk spun on a low friction surface. He noted, as scientists do, that the disk accelerated its spin rate as it got nearer to stopping. Quixotic and paradoxical you might think. 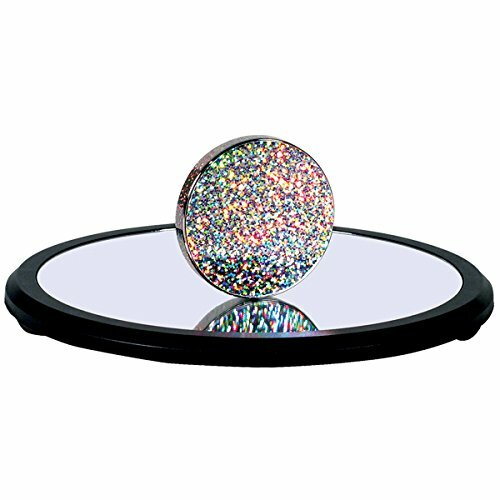 This Euler’s spinning disk is about 3 inches in diameter and comes with a mirrored and magnetic mirror. The disc itself is decorated with magnetic foil that you can swap out to change colours to suit your quixotic mood of the moment. The idea is that the Euler’s spinning disk when spun, spins for a very long time, creating a pleasant sound effect as it does. Why doesn’t it spin off the mirror you may be asking? The mirror has a slightly concave surface in order to encourage the disk to stay where you want it. It is also low friction, thus allowing it to spin for longer. As we know our visitors are all well into science we thought we should point out that the Euler’s spinning disc is affected by friction where it meets the surface on which it is spinning. So low friction – as any man or woman knows – is the key to being able to spin for longer. The disk actually gets affected by wind resistance right before it is about to finish when it has sped up it’s spinning for the climax and abrupt stop. The mirror is about 9 inches across and great for your work desk or wherever you toil at home. It is an excellent gadget to take a break when work has dulled your edges. It weighs about 2 lbs so it not a lightweight toy. Grab one right now why don’t ya? The disk will spin faster and louder the longer it spins.